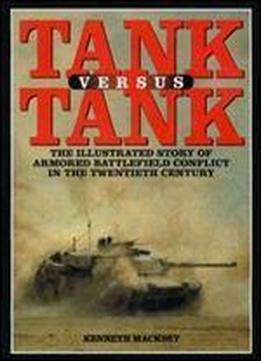 Tank Versus Tank gives a concise, easy-to-read and detailed overview of the history of the tank. Starting with WWI it details how the tank was developed, the technological advances that have gone into tanks, and the doctrines developed to deploy tanks in combat. It gives interesting details about the tank in its history. For example, in WWII tank vs. tank combat was relatively rare and it was much more common for tanks to face anti-tank guns in battle. Most of the book details the history of tank warfare during WWII but it also details developments in tank warfare in the period between WWI and WWII and during the Cold War. The book was originally written just before the Soviet Union collapsed and it is interesting to see how its projections about future tank warfare have turned out. The author's guess that a new tank-destroyer design would be developed have proven to be wrong. The book includes many different technical drawing and graphs showing how different tanks stacked up against each other in areas like armor and firepower. It also details many of the most famous tank battles in history. Overall this book is definitely recommended for anyone who has an interest in tanks or modern warfare.